Seyfert galaxies are named after Carl Seyfert who first described them in 1943. These galaxies are one of the two main types of active galaxies. The other large group are quasars. Seyfert galaxies have quasar-like nuclei: they are very distant luminous sources of electromagnetic radiation. Their very high surface brightness has spectra with strong, high-ionisation emission lines. However, unlike quasars, their host galaxies are clearly visible. Seyfert galaxies are about 10% of all galaxies, and are some of the most intensely studied objects in astronomy. They are thought to be powered by the same phenomena as quasars, although they are closer and less luminous than quasars. These galaxies have supermassive black holes at their centers which are surrounded by accretion discs of in-falling material. The accretion discs are believed to be the source of the observed ultraviolet radiation. Ultraviolet emission lines and absorption lines are the best way to analyse the surrounding material. Seen in visible light, most Seyfert galaxies look like normal spiral galaxies. However, when studied under other wavelengths, it becomes clear that the luminosity of their cores is as big as the luminosity of whole galaxies the size of the Milky Way. 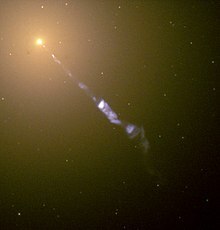 Centaurus A, apparently the brightest Seyfert galaxy as seen from Earth. 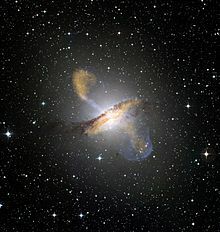 It is a giant elliptical galaxy: a radio galaxy notable for its relativistic jet spanning more than a million light years in length. Messier 51a (NGC 5194), the Whirlpool Galaxy, one of the best known galaxies in the sky. ↑ Petrov G.T. (ed) 2004. Active galaxy nuclei. Bulgarian Academy of Sciences/Institute of Astronomy . ↑ Soper D.E. Seyfert galaxies. University of Oregon.